A journey that unwinds in three main stages, starting from 1870’s Paris, which for over fifty years would remain the nerve centre of avantgarde artistic movements and the emerging art market. The second chapter takes us to America, where the world’s economic and artistic centre of gravity moved during the 1920’s, following in the wake of European migrants, whose numbers included eminent artistic figures escaping totalitarian regimes and racial persecution. An analysis of almost the entire 20th century follows, citing significant artistic experiences connected with the world of economics and power. The last part of MONEY! on the other hand, deals with the expansion of the global economy towards the Far East. Asia’s supercities - Hong Kong, Singapore, Shanghai – are the new settings for the world’s richest markets: new museums, collectors, galleries and fairs create a system once unknown on the art map, witness to an inexorable globalisation process also in the field of the arts. Money is the most immediate, generalized instrument of communication. Money! arose out of a curiosity to explore the relationships between the art scene and the economic system by looking at three continents –Europe, America and Asia – which one after the other have attracted the world’s attention and interests. 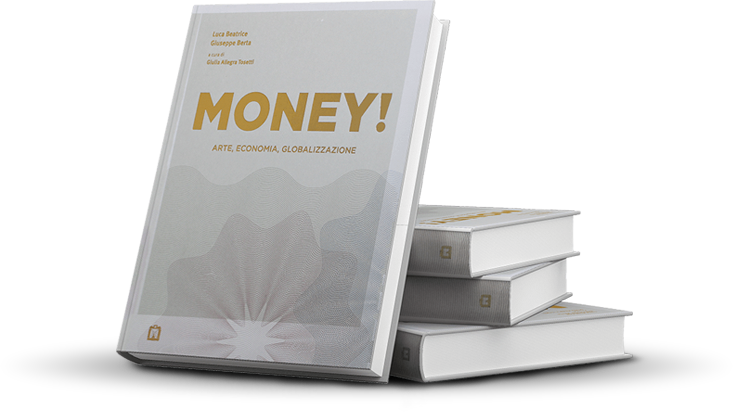 Starting from the idea of exploring two realities that contaminate each other, Money offers a particular point of view of the art world for those who love economics, and an intriguing perspective for art lovers who want to learn about its economic history. Drafting a plan makes it possible to attribute sense and value not only to the end-goal but to the entire journey that unites it to the initial idea. In this sense, even more than a book, Money! is a project for us, one that we hope will contribute to fostering new awareness with regard to the idea of possible communication between art and economy. After an introductory essay, most of the book is devoted to emblematic images which it was decided to comment in separate captions. As we leaf through, History, or rather stories, take shape around a journey that while it is temporal, is also intentionally geographic. The stages of this experience are three continents, and in particular their major cities, new nerve centres that seen in the context of new dynamics become exhaustive keys to interpretation and perhaps answers toa globalisation giant that has a longer tail than is commonly thought. The pens of the two authors let the facts speak for themselves without establishing a hierarchy between the disciplines, leaving it to the events and their various possible interpretations to establish who and what has acquired greater weight and influence over the decades. An opportunity to reflect on the modern social system and on the still valid dichotomy between tangible and intangible value which can be applied as much to a banknote as to a work of art. With no intention to appear textbookish or didactic, the authors have chosen to encourage free associations of ideas in dealing with and communicating the respective disciplines. This illustrated book aims to sow ideas and open up new questions. A text has more to tell the more life, debate, exchanges and re-writing put into it by the groups people involved in its production. When the book was initially conceived, it was tempting to try to find a correlation between economic events and artistic activity, but the pursuit of greater coherence soon made it clear that no relationship between the two was the result of a cause and effect mechanism. The decision to involve Luca Beatrice and Giuseppe Berta was the fundamental basis for the creation of a joint effort. Does the axis of socio-economic interests influence the art world, or does the latter anticipate and inform the thinking behind it? Money! to be interpreted in its absolute subjectivity, invites the reader to form new, personal connections.